Edge is our "keeper" male from our Romeo/Bree litter, born March 16, 2006. A handsome young man, he is a nice blend of Bree's elegance and Romeo's brawn with natural hunting abilities from both. He completed his Conformation Championship at just 8 months of age and had no trouble finishing his FD Jr title in 3 straight tries. Although his NAVHDA Prize was a bit disappointing on the surface, his scores were perfect until the tracking part - with hot, dry conditions, he would start on the track, then use the wind. This gave him half points for tracking, an automatic Prize III. 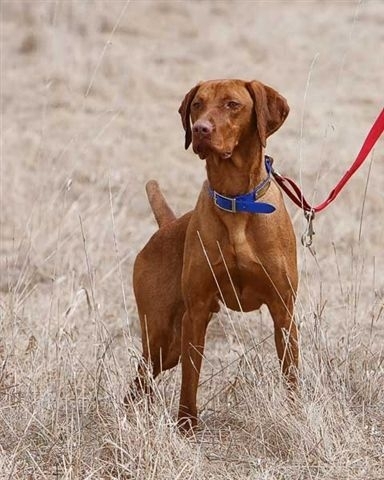 With very limited showing, Edge earned the honor of being Canada's #1 Conformation Vizsla in 2010 and #2 in 2011. He enjoys life in Ontario with his Uncle Ranger and his human family. 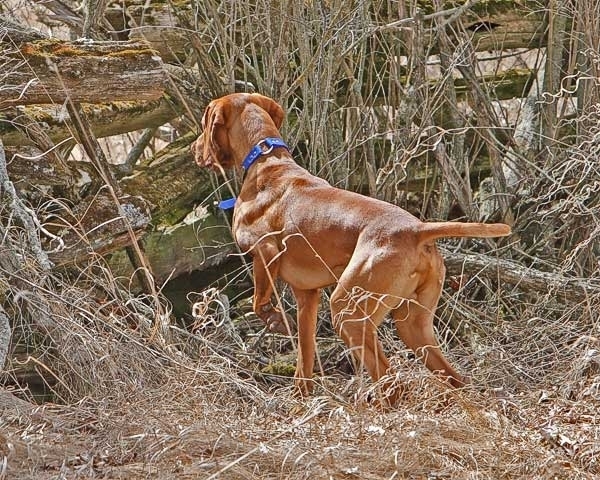 Photos are of Edge at Woodstock, center photo is Edge during field training, and Edge being stacked by Jacqueline of Akar Vizslas.